For some children, the proverbial lemonade stand can amount to more than just a fun summertime activity; it can spark an entrepreneurial fire that carries forward to adulthood. 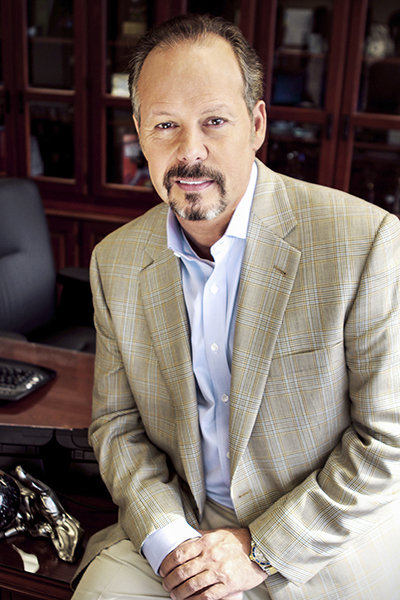 Tony Jimenez—founder, president, and CEO of MicroTech, a technology innovator focused on telecommunications and network system integration—wanted to open a business from a very early age. But he didn’t figure that he would also profit from his natural love of math and science. Born in the Portsmouth Naval Hospital in Virginia, Jimenez is the middle child of Ray and Cecile Jimenez, his father of Puerto Rican descent with a little Cuban on his mother’s side. His father’s twenty-year career in the Navy took the family to several states as well as to Spain. Growing up on a Navy base, however, didn’t expose him to many Latino entrepreneurs, so his early mentors were teachers and coaches. Shortly after graduating from high school, he decided to enlist in the Army, serving for twenty-four years. After two enlisted tours on active duty, however, he received an Army active-duty ROTC scholarship and earned a bachelor’s degree in business management from St. Mary’s University in San Antonio, Texas. He also revisited the sciences when he pursued a master’s degree in acquisition management from the Florida Institute of Technology in Melbourne, Florida, and a master’s degree in computers and information systems from Webster University in St. Louis. His greatest preparation for business came from his years in the military, where he held prominent positions before retiring, including principal advisor on acquisition issues to the Secretary of the Army, program manager for business enterprise systems (PM BES), and program director for eArmyU. After retiring from the Army in 2003, he landed his first civilian job at Unisys, where he served as director of information technology enterprise solutions. But within a year, he was inspired to start MicroTech. One night in 2004, he and an attorney friend sat down in his kitchen to draw up a business plan. Jimenez then took the plan to investors who he knew would give him the space to build the business and provide the knowledge and seed money he needed to start MicroTech. “They were passive partners, but I was able to leverage their experience,” he says. “They had been in business, and I realized that although they didn’t have all the answers, because no one does, they knew more than enough to be phenomenally helpful.” Being one of only a few Latino-owned businesses involved in IT at the time did present challenges like fighting off stereotypes, Jimenez says. But his years in the Army and Washington, DC, also created important friendships and formed key alliances that helped win vital government contracts, and it wasn’t long before the business took off. “I was the first employee, and then I blinked and there were one hundred, and then I blinked and there were six hundred,” Jimenez says. But there also came a time when he saw the next generation of IT turning more heavily toward cloud, network, and cybersecurity, a different direction from where MicroTech was headed. So, he took a step back and chose to refocus his business plan and rightsize the company. During the rightsizing process, MicroTech employee numbers dropped to fifty. Although this was not his original intention, he says that he was able to keep the strategic pieces of the business he needed to build a foundation for the kind of sustainable growth he did not have the first time around, which included a little bit of IT, telecom, and cutting-edge network solutions like cloud integration, managed services, and cybersecurity. Today, he’s on track to grow MicroTech into a billion-dollar company in five years. It’s one of only ten contractors awarded a Federal Enterprise Infrastructure Solutions (EIS) contract focused on network and telecom modernization and integration, which amounts to about $50 billion in contracts spread out over fifteen years. Inspired by the motto, “Luck is what happens when preparation meets opportunity,” Jimenez believes that opportunities arise every day and that preparation in anticipation of opportunity is a big part of being lucky. But if the investment in time and energy has not been made, it might be difficult to seize the moment. Read more Top Ten Líderes features.